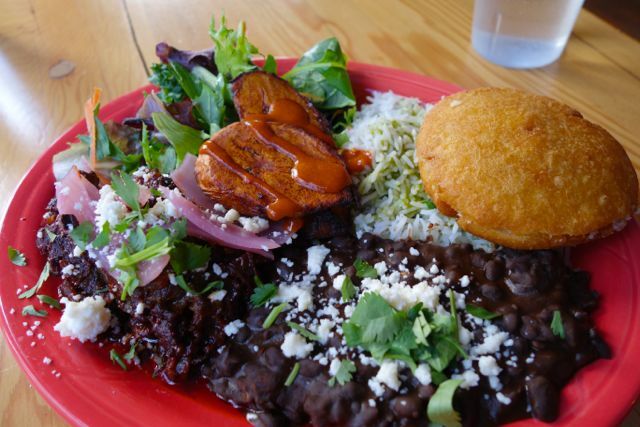 I ordered Teote Plate with your choice of El Diablo, Smokey Pollo, Pabellón, Chorizo or Pernil, served with beans, rice, salad, fried plantains & buttered arepa. I asked him which one I should order and without hesitation he said the El Diablo , which is the Carlton Farms pork belly in a red chili maple sauce, topped with pickled onions, verde sauce and queso. 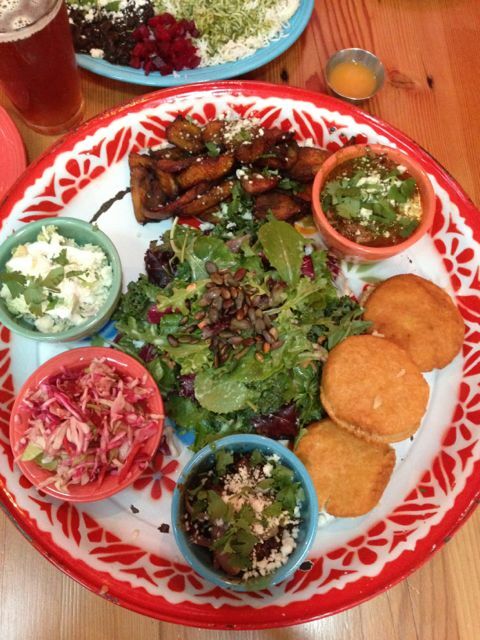 The difference between the plates and the Arepas is that the plate comes with all the sides. At $6.50 there is plenty to eat without having to get the whole plate, I just wanted to try it all for my first visit. After we placed our order she told us that if we had never been before we needed to eat upstairs. We grabbed our number and wandered up. I was stunned by what I saw. It was so different from the downstairs. Such an amazing space. If you look out the back you see this huge outdoor seating with a fire pit and a bar with like 10 taps. After I took all that in and the beautifully decorated bathroom, I made my way to a table, grabbed some of their sauces and silverware and waited. I had heard so much about this place I knew I was going to love it. What I didn’t expect was that the food was going to sing in my mouth. The pork belly was already spicy and I added a little more and it was incredible. The only other place I would describe food singing in my mouth was Carte Blanche. I was so excited about this place I couldn’t wait to get home and tell my husband. It took us less than a week to make my way back and show my husband my new find. I told him we had to order the Pork Belly, but then he sees all the meat options…then he sees the La Cena, the family style meals that feed 3 people and has 3 meat options. Yep, you guessed it, the 2 of us ordered enough food for 3+ people. We chose the El Diablo, Pernil (which is another pork dish), and Reina Pepiada, which is like a cold chicken salad. Again, the El Diablo just sung in my mouth. The others were great, but this one came out as the winner in my book. Yep we got this plus the sides. For those of you that don’t know, Teote is a food cart that has gone brick and mortar. This Latin American street food has been a huge success and after one visit I could see why. I can’t wait to go back during the warmer weather and enjoy the outdoor seating with gas fire pit. This is a great place for Cheap Eats. We did get bigger plates, but you don’t really need all the sides, I was just doing it for research. Atmosphere is incredible and I hear it’s hopping on the weekends. Price is $6.50 for Arepas and $12 for the big plate with all the sides. The family style meal was $36 and serves 3 people and we had plenty of leftovers. Service has been great both times. 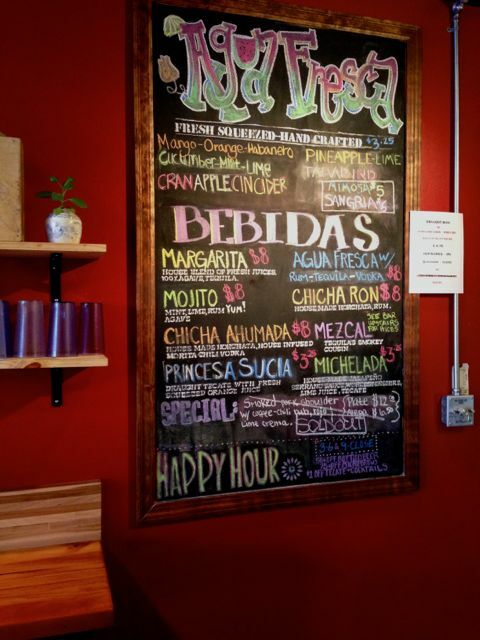 Drinks include a full bar with all the usual suspects, including Mezcal and lots of beer.